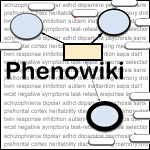 Welcome to the Phenowiki homepage. We are developing a collaborative online annotative database for phenotype selection, so that researchers may freely examine current literature for psychometric and biological validity. We have several example 'screenshots' of pages for tasks (e.g. the Stroop task), papers (published reports in PubMed), and specific effects (empirical results from papers). You may also search and view records currently in our database, before they are implemented in the Phenowiki design under our Search page.